Coming June 30th, 2018 , Disney's Hollywood Studios will welcome the first of the much anticipated expansions that are currently under construction. The joyful, toy-full adventure will give guests a toys eye view of the universe within Andy's backyard. 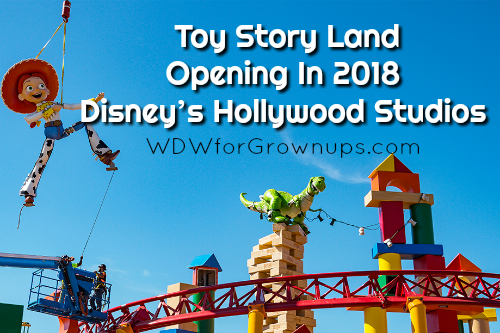 Toy Story Land will let fans get a new perspective on the lives of Woody, Buzz, and all the toy box gang in a unique environment that uses familiar toys as the building blocks. What can we expect in this fun new land? Let's take a peek at what we know so far! 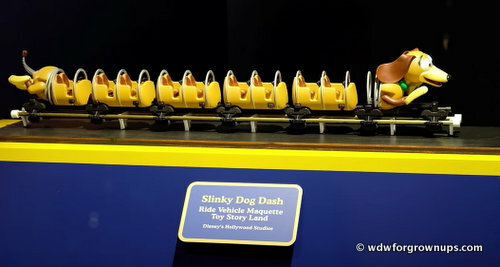 Taking up the largest footprint in this 11-acre play space is the Slinky Dog Dash a new family friendly coaster inspired by the cute and quirky dachshund spinoff of the classic American toy, Slinky. Riders will climb aboard this guy's back for a thrilling trip dipping, dodging and dashing around the yard with all the imaginative turns and drops that Andy has created "to stretch Slinky and his coils to the max." DisneyParks has been posting videos of the project, check out the arrival of the first ride vehicles. Next on the list of new attractions is the dazzling based around those cute little green aliens from the vending machine at Pizza Planet and their cult-like obsession with "The Claw." 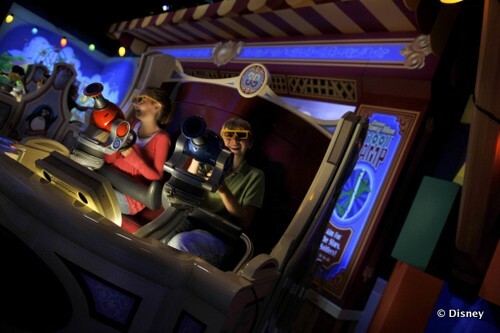 Guests will sit in ride vehicles that rotate around toy planets and satellites their bathed in lights, sound effects, and space jazz created just for this attraction. Alien Swirling Saucers will try to capture your rocket toy vehicle with "The Claw" for a lively turn at the game. 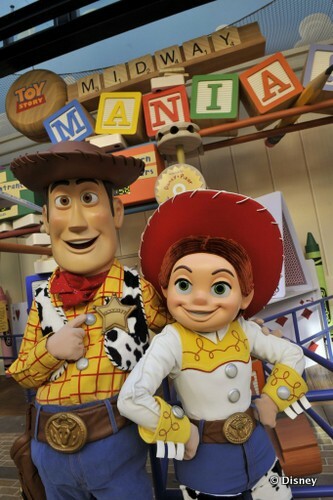 In addition to the two completely original attractions coming to this land, Disney made existing Toy Story properties even better for the expansion by adding a third track to one of its most popular attractions, Toy Story Mania! Riders get competitive on this quest to hit the moving objects during this midway-inspired, game and ride that stars Disney*Pixar Toy Story characters. Guests only need to hop in a swiveling carnival car to venture into this rowdy 4D world that will have you hootin' and hollerin' at the fun. Just across from the entrance to Toy Story Mania, autograph seekers and photo hounds will find a character greeting area that features Buzz, Woody and an array of other friendly Toy Story characters throughout the day. Finally - when it's time for a bite to eat, simply mosey on over to Woody's Lunch Box. Andy's set up his lunch box and thermos to act as a quick-service window for all the toys and guests. Sponsored by Mini Babybel, Woody's Lunch Box will offer tasty meals and old-fashioned soda floats. Seating for the new restaurant will be outside in a courtyard camp of colorful tables beneath shady umbrellas. Over the next few months we're sure to hear more exciting information about this fun new land coming to Disney's Hollywood Studio! 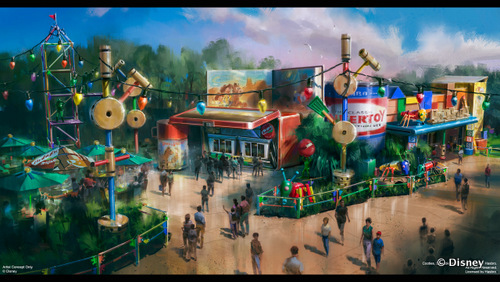 What are you most looking forward to in Toy Story Land? Leave a comment and let me know! I can't wait to ride the Slinky Dog coaster. hello thanks for this information, has there been any announcements if there will be any toy story character meals? As far as we can tell there will not be a Character Meal here. The only restaurant associated with Toy Story Land at this time is a Quick Service location. There will however be a Meet & Greet location across from the restaurant.